TheTravelzine Italy 2007 - Perugia. 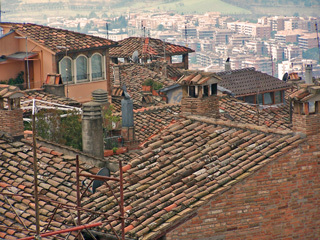 Perugia sits high atop a clover-shaped hill with its medieval quarters sprawling down the hillside. The ancient majestic walls and gates dating back to the Etruscan and Roman age circumscribe what is still the heart of the city. The gates open to the roads that lead to the countryside and major towns in the area. About the mid-11th century the town was divided into five administrative districts which took their names from the medieval city gates. Each district had an ensign with its own colors and symbols which exists today. In fact there are five suggested itineraries that correspond to the town's color coded system with 128 brass signs installed throughout the five districts in front of each of the featured monuments. However, we chose to improvise. Many years ago, we had parked down below and taken the escalators through the heart of the city to the top. Arriving by train today we found that there is a constant flow of buses from Piazza Vittorio Veneto in front of the train station to Piazza Italia in the city center, 10-15 minutes away. The Hotel Fortuna, is located on Via Bonazzi, 19 just off Piazza Italia, a few meters from the main street, Corso Vannucci and the City Palace. The exterior of the charming, vine-covered 13th century building, on a quiet, narrow street, reflects the warmth and gracious hospitality we encountered during our stay. Our 5th floor bedroom, bathroom and private terrace overlooked the city roof tops and surrounding countryside. The view from the hotel roof-top garden terrace across the way gave us yet another perspective. Our large bedroom was nicely furnished with twin beds, a desk and chairs, satellite TV, remote climate control plus a safe and mini-bar with an oversize stall shower and a hairdryer in the bathroom. All 51 rooms are different. There are rooms with 18th century frescoes, whirlpool bath tubs, terraces or private living rooms - something for all tastes. The perfect old world reading room, complete with pastel frescoes, was very inviting. There is an Internet point off the lobby that can be used free of charge from 20:00 to 24:00 or by payment at other times. Breakfast is served in a stunning medieval style room with a brick and pastel frescoed ceiling and stone floors. The buffet of traditional products was well presented and maintained. Corso Vannucci is a fascinating pedestrian thoroughfare that runs through the center of the city from Piazza Italia through Piazza Republica to Piazza IV Novembre. During the day it appears to be just an average shopping and commercial venue but when darkness settles-in and the historic buildings and shops light up the atmosphere turns intriguing and exciting. Piazza IV Novembre is the heart of ancient Perugia, home to many historic buildings. The Palazzo Dei Priori with a series of mullioned windows and an imposing Gothic portal that leads to the Sala Dei Notari, a marvelous hall supported by eight large arches. It was used for peoples assemblies during the Free Commune. In 1582 it became the seat of the Arte dei Notai. Fontana Maggiore, in the center of the piazza, was built in the 13th century to commemorate the completion of the new aqueduct. The Cathedral was designed about 1300 as a replacement for the earlier Romanesque cathedral. The facade on Piazza Dante and the side facing the fountain are incomplete. 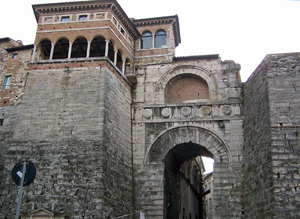 The Logge di Braccio (commissioned in 1423 to be connected to a nearby residence which no longer exists) preserves 4 of the 5 original arches, supported by octagonal columns. Below, on the right, are the remains of the early cathedrals bell tower as well as a portion of wall in Etruscan travertine blocks. The front desk staff at the hotel recommended a pizzeria and two restaurants. Mediterranea Pizzeria, Via Bontempi, just east of P. IV Novembre was an excellent choice for lunch. Brick walls and ceiling, wood burning oven, jam packed with locals and purported to be Napoli style pizza - the omens were good. One Margherita straight and one with funghi, both were excellent. The crust was delightfully chewy and the ingredients were top quality and properly handled. Via dei Priori runs west from P. IV Novembre, the location of the Cupa-Priori escalators (installed in 1989 as an innovative system to access the ancient town center on foot) and the Church of Santa Teresa Degli Scalzi with yet another unfinished facade. The adjacent convent is used as a school. Nearby is Porta Trasimena (oriented toward Lake Trasimeno), one of the five Etruscan gates and is original up to the springers of the arch. It's also known as the Porta di San Luca because of the proximity to the church of the same name. A detour to the left on Via della Sposa brought us to Porta di Santa Susanna, which was a part of the medieval walls. Back the other way is Piazza San Francesco a popular meeting spot for young people and foreigners. This is a major university town including a University for Foreigners, which is the oldest and most prestigious in Italy for the study and teaching of the Italian language, culture and civilization. The piazza is dominated by the Church and Convent of San Francesco al Prato. A Renaissance archway connects the convent to the Oratory of San Bernardino, itself a Renaissance jewel with a multicolored facade decorated with beautifully carved bas-reliefs. The store windows along Corso Vannucci and all of the pretty side streets were filled with those inspiring SALDO signs indicating 30% to 50% off. Tempting, but we spotted the Coin department store going out of business signs offering 50% to 70% off, they were talking our language. We could not resist and several hours later, we emerged with our bargains. Since the pizza was so good we had no problem moving on the next restaurant recommendation, Il Settimo Sigillo, Via Ulisse Rocchi, 1, tel. 075 5724 306. The name translates into "seven stamps" which has a medieval connection. The vaulted brick ceilings and stone walls decorated with medieval body armor and weapons bring "medieval" to life. We were seated in a room with an attractive bar. The owner and staff were a delight. The house-offered prosecco, goat cheese with pepper and goat cheese with prosciutto on bread were delicious starters. The "cucina tradizionale", menu was reasonably-priced for the quality of product and preparation. The pasta primi were fabulous; tagliatellina ai funghi porcini and the same noodles del templare (zucchini, baby asparagus, carrots and goat cheese). 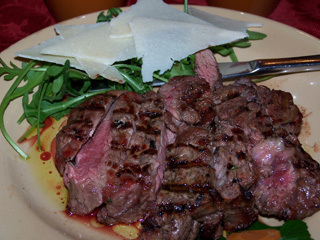 I had a filetto alla griglia and Linda, her favorite tagliata con grana e rucola. The meats were tender and grilled crisp outside and juicy inside. For dessert, the owner recommended Tiramisu, a delicious, unique version with chocolate chips, which was wonderful. The house rosso was fruity and dry. Be sure to make reservations as its always fully booked. What to do on a rainy day, head back to Coin on the hunt for items reduced 70%, at which point even with our Canadian dollars, weve snagged a bargain. Back on Corso Vannucci, we stopped to admire the Teatro del Pavone, one of three major theatres in Perugia. Just up the way is Palazzo Graziani, beautifully designed by the architect Vignola in the late 16th century. In the 19th century Annibale Brugnoli decorated the Reception Hall with episodes from Perugia's Risorgimento, reflecting the spirit of the times. And finally the Collegio Del Cambio, a wing of the Palazzo dei Priori given to the Moneychangers Guild. Around 1500 Pietro Vannucci, known as Perugino, frescoed the Sala deli'Udienza, one of Perugia's most famous Renaissance monuments. We headed north from P. IV Novembre up Via U. Rocchi through the Augustan Arch or Etruscan Arch, a monumental city gate in the Etruscan walls built in the 3rd century B.C. Its flanked by two turrets built on a trapezoidal plan and is probably the most photographed monument in the city. Just across the way is the Palazzo Gallenga Stuart, formerly the residence of the Antinori family which was donated to the Municipality of Perugia in 1931 and is now the seat of the University for Foreigners. Just ahead was our destination for a late lunch, Ristorante Dal Mi' Cocco, Corso Garibaldi, 12, tel. 075 5732 511. We had been told to expect a very unique eatery and to be prepared with huge appetites. There is a set menu price of 13 which includes: appetizers, primi and secondi, different every day, vegetable, dolci and bread. Beverages are extra, we had a bottle of wine for 4 and a liter of mineral water for 1. The ambiance is casual, brick vaulted ceiling, stucco walls and checkered table cloths. A good time is had by all, including the staff. We started with assorted crostini del mi'cocco, bruschetta, schiacciata la cipolla and la salvia e 'L tresmarino. Todays primi (Friday) was quadrucci chi ceci, macaroni with chickpeas followed by a huge terrine of vegetable soup (eat all you want). The main course was breaded, baked chicken with fresh mixed greens and radicchio. No sooner had we finished the large portion of chicken then our friendly waiter was at our table offering seconds. A delicious cream cake finished us off. The family produces all the ingredients on their own farm, including the wine. All the food is prepared in the restaurant cucina, including the pasta. It's quality home cooking at its best, an incredible value, which is why its essential to call for reservations. It was a pleasure to spend the rest of the day wandering the streets and alleyways admiring the fabulous architecture and spectacular views from every vantage point. Perugia should not be overlooked; there is more to it than chocolate. Next stop, Foligno.